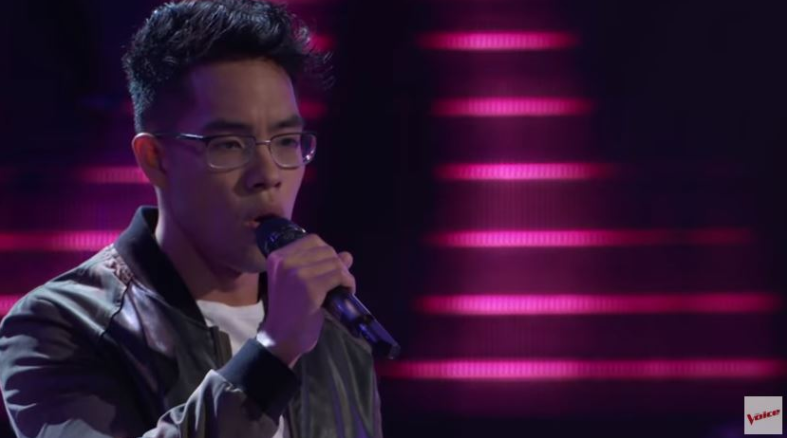 The Filipino singer based in Los Angeles, California, got a four-chair turn at the American reality singing competition "The Voice." The 22-year-old Jej Vinson who performed Drake's "Passionfruit" impressed judges - Adam Levine, John Legend, Kelly Clarkson and Blake Shelton. Blake Shelton: "I think everybody here is probably a little bit nervous talking to you right now because we all feel like we're looking at the winner of The Voice this season." Kelly Clarkson: "Is someone that I hope is on the radio someday because we need it. There aren't singers like that." Adam Levine: "Maybe the one thing you'll need to make sure you don't do, is be too perfect. There's something that is so almost like surgical about how perfectly placed about how all those runs what I would wanna do as your coach If were to be so lucky is to make sure we can get to place where people can feel you as well as they can hear you that to me is the number one thing moving forward making sure you can navigate to the competition and keep everybody connected to your heart." Vinson, however, picked pop singer-songwriter Kelly Clarkson as his coach. Jej was born and raised in the Philippines. He started singing karaoke after watching his parents sing in choir. When he was 15, his parents moved the family to America for a better life and landed in South Dakota. At the age of 18, Jej joined an a cappella camp in Los Angeles. Jej continue his passion to music and formerly the music director of the a cappella group. Outside of school, Jej has a part-time job at a restaurant.